And so it goes: at the end of my last post, I eagerly (and earnestly) promised, "Product Review Week is ON!" I have so much tea to spill on new beauty releases, holy grail items, and makeup mishaps. But as a busy mom keeping the children nurtured, carting them to classes, maintaining a home, studying gemology online (believe it), and fitting in a little bit of paid consulting work, I unfortunately let a whole 7 weeks slip by before posting again. It was le soin noir (or, the dark night) for the Mom in Mascara blog while all the other stuff in life was happening at a bright clip. I bought into it: you know me. 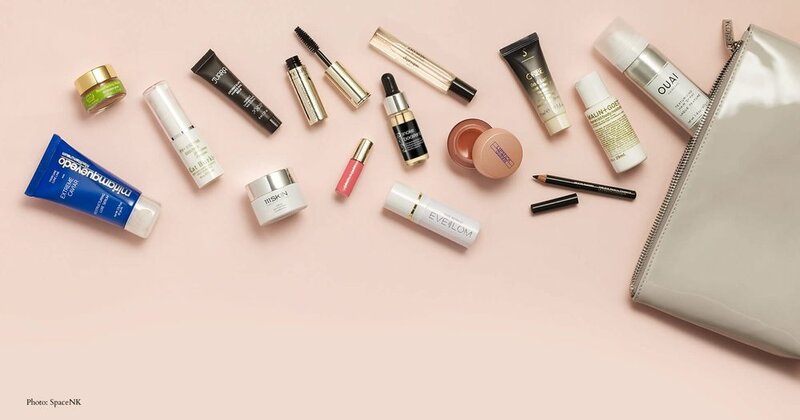 First, as a sidebar, the SpaceNK Essentials beauty bonus is on. If you spend $150 on cosmetics, skincare, fragrance, and/or grooming, you get the below amazing bag of deluxe samples... But, don't all of you rush to buy me gifts, yet. Pace yourselves, because the rest of my holy grail product reviews actually are coming. I'd love to share which products are my favorites before you buy the place out. That is, if anyone believes my promises anymore. It was during the another blow-your-mind beauty gifting affair (Barney's legendary Love Yourself event) that I explored Givenchy beauty. Above, see Givenchy's prismatic 4-well color-correcting powder, and the limited-edition special spring packaging. 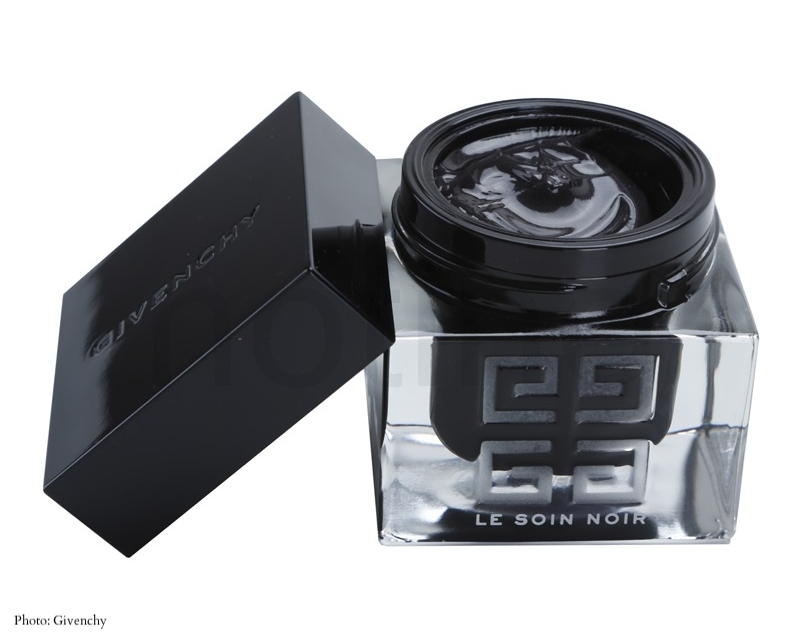 Givenchy's "Le Soin Noir" skincare line is unique in its coloring. Each luxe skincare product is truly black. Givenchy states, "black is the new luminous" and that their "algae-enriched formulas visibly restore the glowing, freshness of youth". The idea slathering my face in the "highly restorative properties of vital black algae sap concentrate" sounded superb... except that the cream was... well, really and truly, thickly, abundantly black. Strangely black. It was ambiguous in its inexplicability. It's "vital" black algae sap! Cool! I don't get it! Awesome! Wait, for my face? I'm scared! Despite the odd fascination and the legit fear, I did go ahead and dig in. The face cream is wonderfully luxurious, and inexorably mysterious, but just too expensive for what you're really getting. However the lip balm (one part of the two-piece Givenchy Le Soin Noir Baume Levres set) is glorious and has become one of my holy grail beauty go-tos. The blackness doesn't exactly tint the lips as much as lend a tiny hint of depth, and it's soothing beyond measure for winter-chapped or sunburned lips. And the lucite packaging is to die for. So much so that the spectacular little clear acrylic container finds a regal placement on my nightstand. Guess who else likes this fancy, pricey lip balm? This little diablo. There goes my cheddar. Dumb nightstand miscellany. Yes, the black "stuff" all over his little face is my fancy Le Soin Noir lip balm. And his hair looks crazy-laden with product because he swiped his "noir"-greased hand in his mane. I had to scoop out the entire top layer of ointment, because the last thing this little BUGGER touched before my balm was, well, a BUG. The dark of night... for my wallet. P.S. Sorry to leave you hanging for 7 weeks!